Max & Co. launches its new project, ARTtoHeart for Angels, today. 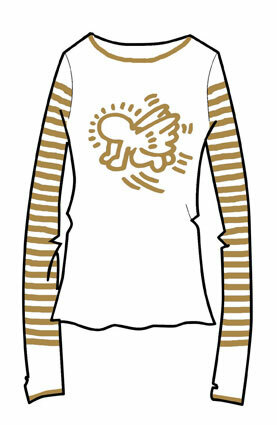 Merging art and charity, the collaboration with the Keith Haring Estate has resulted in a limited collection of T-shirts and sweatshirts for women, girls and infants, featuring the artist's iconic happy angel and angel baby. Ten percent of funds raised through sales of the shirts will benefit Save the Children's aim of providing basic education for children of South Sudan. Haring was among New York artists in the early 1980s drawn to Andy Warhol's fusion of art and life and the idea of public art as a medium for social expression. He created many works for children's hospitals, day-care centers and orphanages around the world until his death in 1990 from AIDS-related complications, at the age of 31. Baby tees are $55, long-sleeve tops are $85 at the Ala Moana boutique, and will be available through February. Call 943-6262.